This is somewhat less than the common tame Duck. 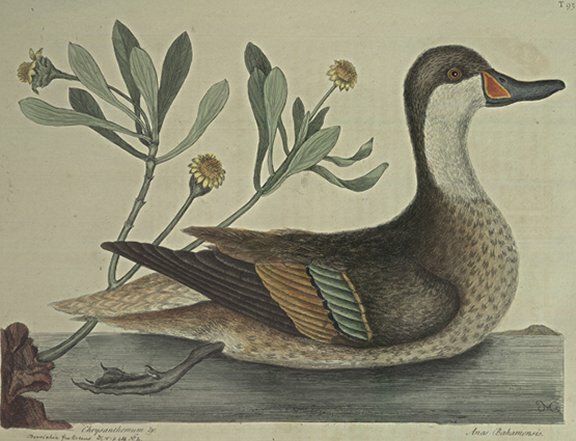 The Bill is dusky blue, except on each side of the upper Mandible: next the Head is an Orange-colour'd triangular Spot; the Throat and all the fore part of the Neck, to the Eyes, is white: the upper part of the Head is of a mixed gray, inclining to yellow; as is the Back and the Belly: the upper part of the Wing and Quill-feathers are dark brown; in the middle of the Wing is a Row of green Feathers as in the common Teal, bordered towards the Quill-ends with yellow, and their ends black; below which, and next to the Quill-feathers, is a Row of yellow Feathers. The Feet are of a Lead-colour. These Birds frequent the Bahama Islands, but are not numerous, I never having seen but one, which was a Drake. This Plant grows on Rocks on the Sea-Shores of most of the Bahama-Islands. It grows usually to the Height of 4 or 5 Feet, with many pliant green Stems arising from the Root; the Leaves are long, increasing in width gradually to the End; and in Form resembling the Leaves of the Stock Gilly-flower; they are thick, succulent and of a shining Green, standing opposite to one another. The Flowers grow singly at the Ends of the Branches, on Foot-stalks of four inches long.